Hi, happy Saturday everyone. 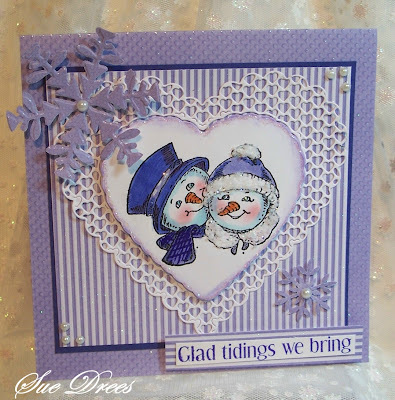 My card today is a sweet Snowman Couple from Designs Unlimited. I bought it at the Stamp show I attended last Saturday. I love Christmas stamps, kinda addicted to them, but find that I only make about a dozen of the 60 or so cards I mail out each year..........sad, so I thought I would try to make one each week...we'll see. How sweet is this darling couple. Orchid Marvey ink for distressing around the heart. This is sooooo darn cute :O) Love it! so cute! Oh my, I have not made any this year. I think the wedding is going to kill my stamping time for holiday cards! what a lovely image and card sue. That is such a precious Christmas card. I love the heart die. I'd like to find that one for myself. This is adorable. Love the colours you have used. 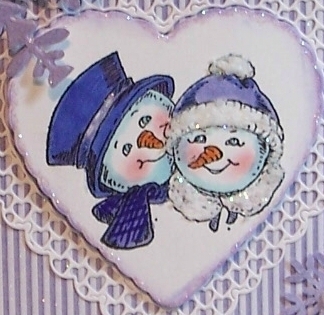 Just so adorable, what a wonderful Christmas card, Love the blue tones, the heart shape frame and the image is so sweet.